As mentioned earlier, here is the Nicolas Tractormas RDC318X seen on Billingham Bank ''UK'' in 1994 this time with Econofrieght. Seems like a Renault or Berliet cabin?!! Added by Jacques PETER on 11 February 2013. Yes the Cabin was the Renault / Berliet cabin. Nicolas Tractomas was a French company to. The same cabin was also supplied to Ford for the Transcontinental. 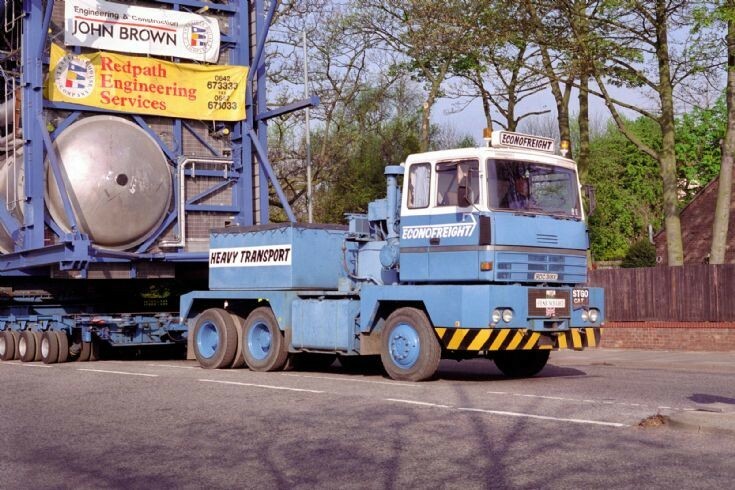 The Nicolas is a purpose built heavy haulage vehicle as you can see the cabin is elevated above the purpose built chassis . The chassis having a very wide track to..
Added by Richard Wilkinson on 11 February 2013.